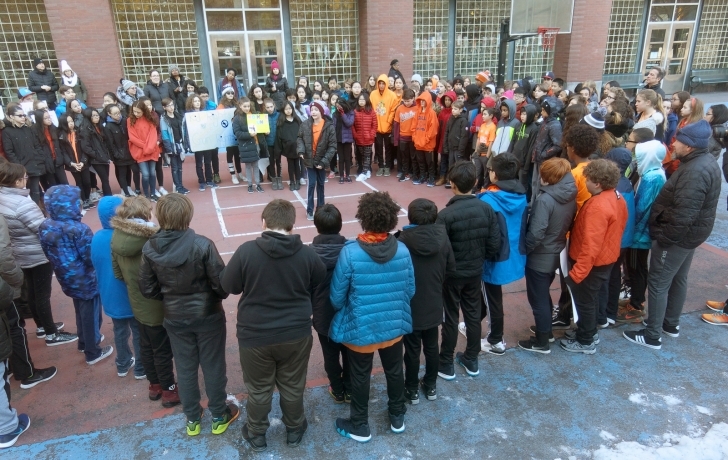 Like other students around the city and the country on Wednesday, kids in Lower Manhattan schools found ways of their own to join in solidarity against the kinds of guns and gun violence that one month ago took 17 lives at Florida’s Margory Stoneman Douglas High School. Even for children too young to know the terrible details, it was in some schools a time of song in praise of peace. Here is how students in many of Downtown’s schools chose to commemorate National School Walkout Day. PS 234 Students Say, "Put a Little Love in Your Heart"
On April 20, the 19th anniversary of the Columbine shooting, peace and non-violence will be the all-day classroom topic at PS/IS 276. Cuomo Joins Leadership and Public Service High Schoolers in "Die In"
This school had its protest in Zuccotti Park, where students held a “die-in.” Lying down with them was Gov. Andrew Cuomo, clapping along and chanting “Enough is enough!” Also prostrate on the plaza nearby was Randi Weingarten, president of the American Federation of Teachers, and former United Federation of Teachers president Michael Mulgrew. The canyons of Wall Street literally echoed with the chants of students whose schools are just a few blocks away. Some 500 students, faculty and parents from Léman Manhattan Preparatory School gathered in front of the New York Stock Exchange, where four students and the head of school, Maria Castelluccio, made brief speeches. “Don’t you think it is unbelievable that we are sending kids to school to protect their future while we can no longer protect their present?” said 12th grader Juan Pava. LMC students filled Broad Street with hundreds of more kids, chanting “No more silence, end our silence” and “NRA, go away,” while holding signs with an array of anti-gun messages. “One child is worth more than ALL the guns on earth,” read one. “Am I Next?” asked another. Richard R. Greene High Schoolers say: "I Believe We Can Win"
The high school students exited their building on Beaver Street and headed south, struggling to keep a grip on signs that kept catching the wind. Standing in front of the Museum of the American Indian, they repeated the megaphoned chant led by student Brendan Gonzales. “I believe that we will win!” they shouted.